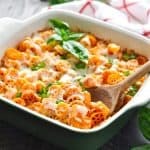 With just 3 ingredients and about 5 minutes of prep, this Dump-and-Bake Wagon Wheel Pasta Casserole is an easy and healthy vegetarian dinner that's perfect for busy weeknights! 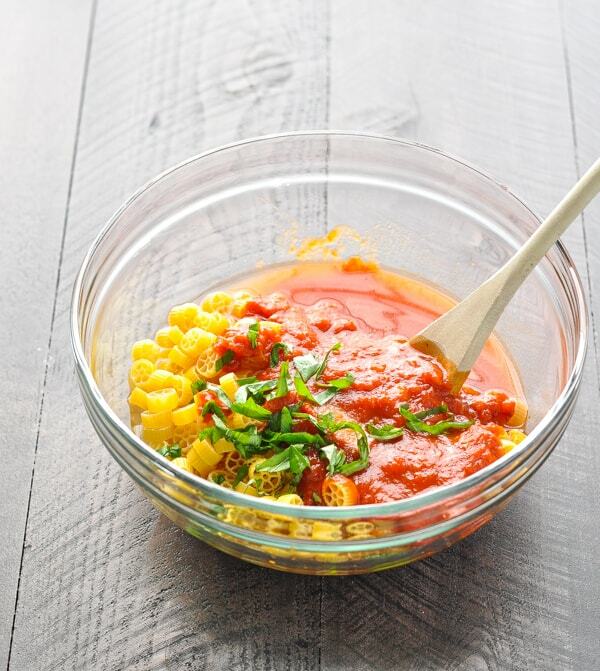 Are you looking for a new family-friendly vegetarian recipe to shake-up your regular routine? 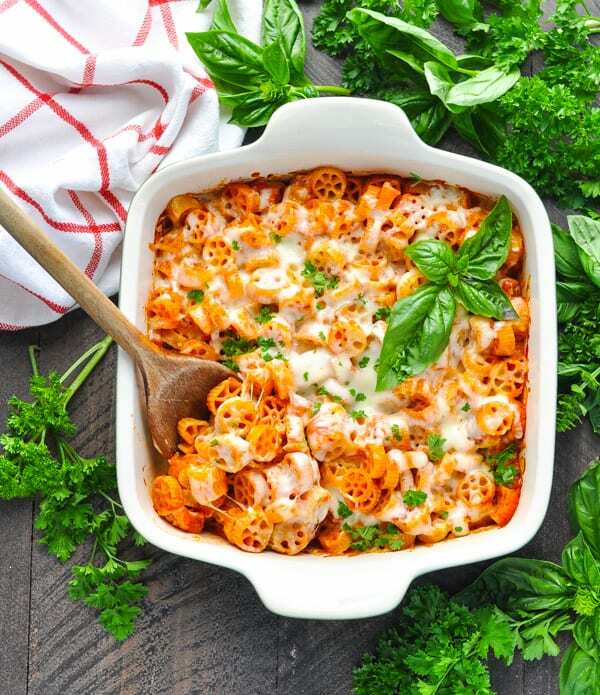 With just 3 ingredients and about 5 minutes of prep, this Dump-and-Bake Wagon Wheel Pasta Casserole is an easy, healthy dinner that’s perfect for busy weeknights. You don’t even have to boil the pasta before it goes in the oven! 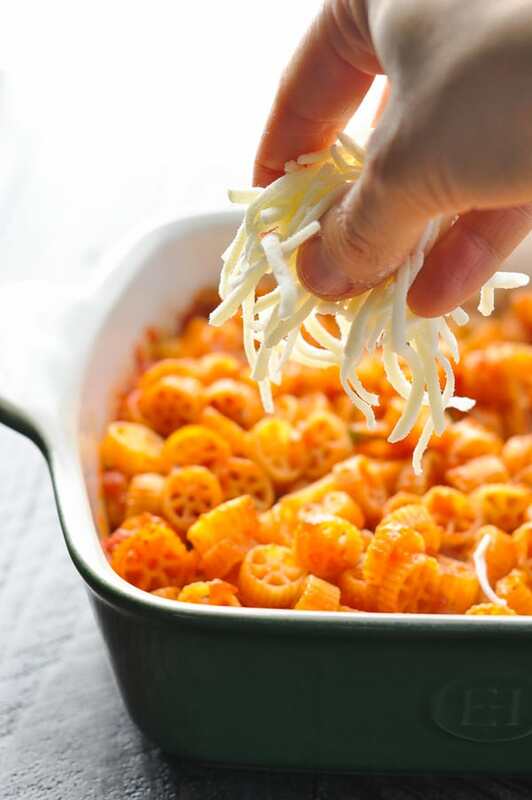 My children love mini wagon wheel pasta so much that it’s one of those pantry staples I keep on hand at all times. Unfortunately, my little rural grocer doesn’t carry the stuff, so I either have to drive to “the big city” to find it, or I just place an order on Amazon. Thank goodness for mail order everything! 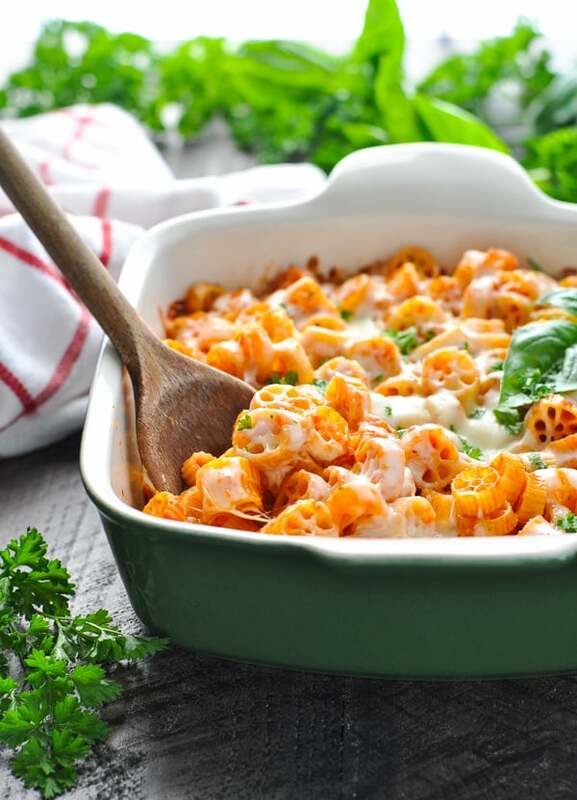 Of course, if you don’t have wagon wheels, but you want to prepare this pasta casserole tonight, you can easily substitute with elbow pasta. The elbow macaroni has the same cooking time as the mini wheels that I used here, so it’s another great option! 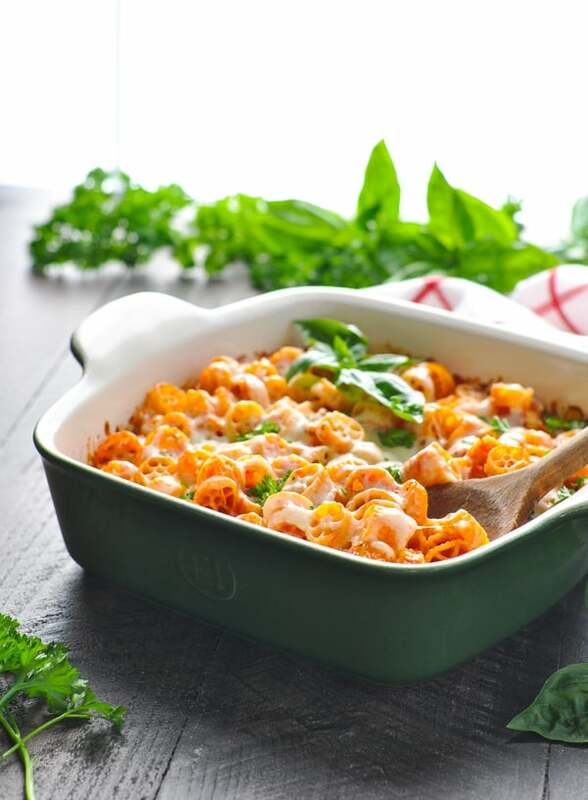 As I mentioned above, you’ll need just 3 main ingredients for this simple vegetarian pasta casserole: mini wheels pasta, grated mozzarella cheese, and marinara sauce. And I’m not kidding when I say that it only takes about 5 minutes to stir this meal together! First, combine the dry (uncooked) pasta, the marinara sauce, water, salt and a bit of fresh basil (if desired). That basil is optional, but gives the dish a nice, fresh burst of flavor! Transfer the mixture to a baking dish and cover with foil. Bake the pasta casserole, covered, at 425 degrees F for 25 minutes. At this point, the pasta should be almost done, but still just a little bit firm (“al dente”). Give the dish a stir, sprinkle the top with shredded cheese, and put the casserole back in the oven (NOT covered) for about 5-10 more minutes (or until cheese is melted and pasta is tender). 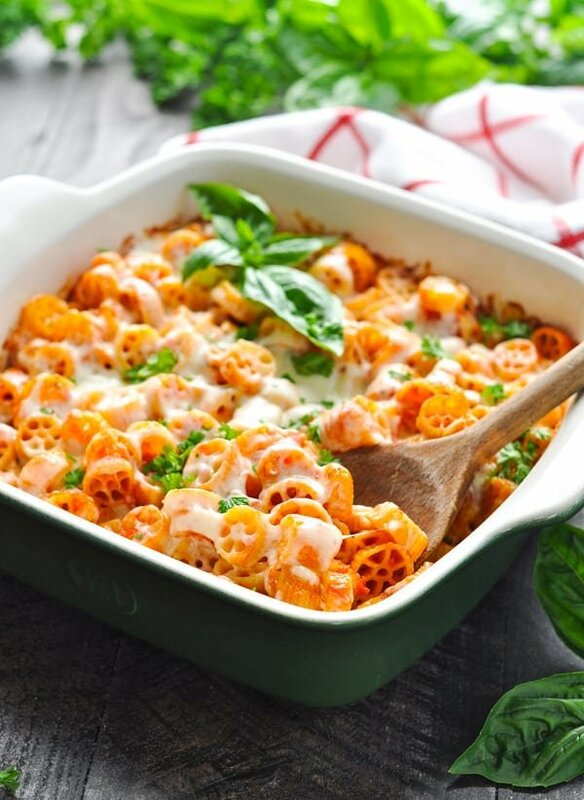 The wagon wheels absorb the liquid as they bake, resulting in a healthy pasta casserole bake that adults and kids can all agree on! Can you freeze this pasta casserole? Yes, you can! It’s not my first choice; however, because I worry that the texture of the pasta gets a bit compromised as it sits in the liquid. If you do choose to prep ahead and freeze the casserole, just know that the pasta might be a bit softer when it’s done baking. I recommend freezing this dump-and-bake casserole before baking. 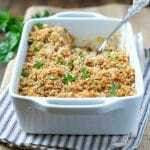 Thaw the casserole in the refrigerator overnight, bring to room temperature on the counter for about 20 minutes, and then bake according to the recipe instructions. To bake a frozen casserole straight from the freezer, you will need to increase the baking time significantly. Start with baking the dish (covered) for 1 hour at 425 degrees F, but stir the casserole occasionally and check pasta for tenderness as it cooks. 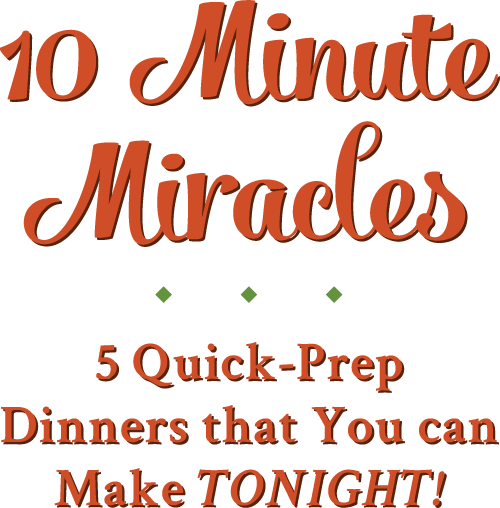 The final cooking time will vary slightly, depending on the type of dish that you are using. This vegetarian pasta casserole obviously has no meat. Feel free, however, to add your favorite protein to the dish. Nice options include 1 lb. of cooked ground beef, ground turkey or ground chicken; 3-4 cups of cooked, diced chicken breast; or 1-2 cans of beans (drained and rinsed). Stir in some veggies! If your kids like peas, zucchini, or frozen broccoli, stir that into the dish as well! If you’re using a larger vegetable with a longer cooking time (like broccoli), you may want to steam the vegetables first before adding to the dish. For something small like frozen peas, you can just add them (still frozen) straight to the baking dish towards the end of the cooking time. 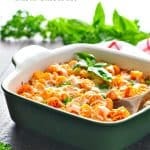 Cooking for a smaller family? I like to cut the ingredients in half and prepare the casserole in an 8-inch square pan. You can also use the full amount of ingredients, but divide the mixture evenly between two 8-inch pans. Bake one now, and freeze the other casserole for a later date! 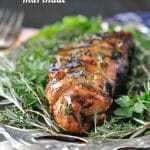 Garnish with grated Parmesan cheese or chopped, fresh herbs, if desired. Preheat oven to 425 degrees F. Spray a 9 x 13-inch baking dish (or two 8-inch square baking dishes) with cooking spray. In the prepared dish (or in a separate bowl), stir together dry (uncooked) pasta, marinara sauce, water, salt and basil (if using). Cover tightly with foil. Bake (covered) for 25 minutes. Remove dish from oven, take off cover, and give the pasta a stir. At this point it should be almost done, but still a bit firm ("al dente"). 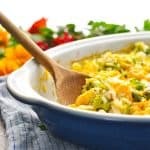 Sprinkle the grated mozzarella cheese over the top of the casserole. Return the dish to the oven (uncovered) for an additional 5-10 minutes -- or just until the cheese is melted and the pasta is tender. Garnish with optional grated Parmesan cheese and fresh herbs, if desired. Stir in some veggies! If your kids like peas, zucchini, or frozen broccoli, stir that into the dish as well! If you're using a larger vegetable with a longer cooking time (like broccoli), you may want to steam the vegetables first before adding to the dish. For something small like frozen peas, you can just add them (still frozen) straight to the baking dish towards the end of the cooking time. Yes, you can! It's not my first choice; however, because I worry that the texture of the pasta gets a bit compromised as it sits in the liquid. If you do choose to prep ahead and freeze the casserole, just know that the pasta might be a bit softer when it's done baking. This post was originally published in February, 2014. It was updated in December, 2018. This looks delicious!! I love the idea of using this mini pasta in the dish 🙂 Pinning now, thanks for sharing! Hi Hannah! Thanks for stopping by, and I hope that you enjoy the casserole! LOVE using fun shaped noodles to for the kiddos, but I’m also going to say it’s fun on my end too 🙂 This looks wonderful! Hi Julie! 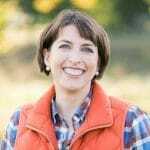 I love your blog — thanks so much for stopping by mine! Where did you get the noodles from? Hi! Thanks so much for reading the blog and for commenting. I don’t have a ton of helpful tips for new blog writers, since I don’t consider myself much of an expert. 🙂 The best advice I could give you is to pick topics that you’re genuinely interested in and excited about so that you have fun over the long term, and to just stick with it. It takes a while for a blog to build momentum, so don’t get discouraged if your mom is the only one reading it for a while! I love wagon wheel pasta! This looks awesome Blair! 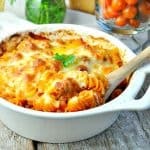 My kids love wagon wheel pasta, will have to give this one a try, thanks! This looks delish. My daughter loves pasta, so I’ll definitely give it a shot! Thanks, Cailin! Definitely give it a try…I hope your daughter loves it! 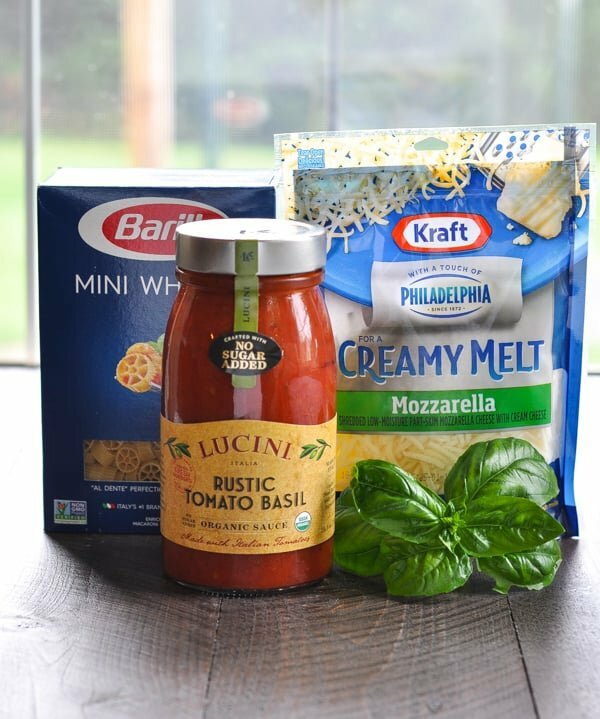 I know it’s been a while since you posted this recipe but quick question… If we were adding some cooked ground turkey, should we add it to the dry pasta mixture or after it has cooked for the first 30 minutes? Hi there! We loved the original recipe! We made this updated version last night and have to say we were disappointed – not that this version was bad but we liked the original.. Any way you can post the original recipe? Thanks! Cook pasta for about 1-2 minutes less than called for on the package directions. You want it to be slightly under-cooked so that it doesn’t become mushy when you bake it in the oven later. Meanwhile, in a large bowl, beat the eggs, salt, garlic, and pepper. Add beef and mix well. Sprinkle with Parmesan cheese and bread crumbs; mix gently. Crumble beef mixture into a large skillet. Cook over medium-high heat until meat is no longer pink; drain. Stir in the marinara sauce. Drain pasta; place in a large bowl. Add beef mixture; sprinkle with 1 cup mozzarella cheese. Toss until pasta is well coated. 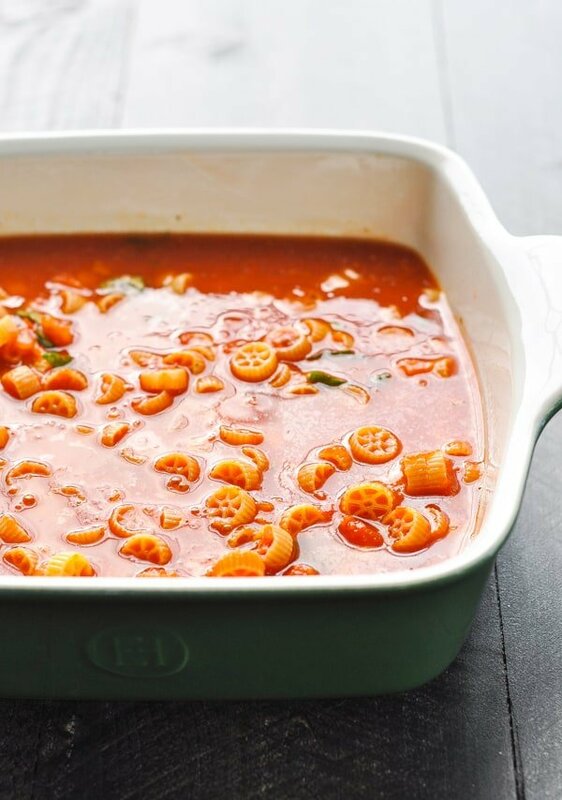 Pour pasta mixture into a 13×9-inch baking dish (or into two 8-inch square baking dishes). Top with remaining 1 cup of mozzarella cheese. Cover and bake at 350 degrees F for approximately 30 minutes. Remove cover and bake for an additional 5 minutes, or until top browns and pasta is heated through. Serve with additional Parmesan cheese on top, if desired. Can you send me the recipe with ground beef in it? I never wrote it down and my family loved that recipe. Oops I just seen that someone asked above and you gave recipe sorry. Hi! 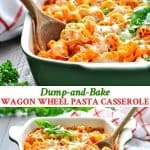 You had a wagon wheel pasta recipe that my family absolutely loved. It looks like you’ve changed the recipe and I can’t seem to find the old one. Do you know where i could find it? Thanks so much! I’ll be printing it this time so i don’t lose it. This one is a keeper!! This looks delicious! Do you think the recipe could be doubled? If so, do you think I would need to adjust the cooking time? Thank you! Hey, Erin! Yes, it can definitely be doubled! Just double all of the ingredients and bake it in two separate dishes (or one really giant dish if you can find it). The cooking time should be about the same! Thank you for the quick reply— can’t wait to try it out!! Hey, Emily! You’re right — the cheese just stays on top, no stirring necessary! 🙂 But that’s okay — I’m glad that your son enjoyed it!